The next theme at A Vintage Journey challenge is to use WORDS - I've used quite a few but the main one is DREAM. The background is a swooshy mix of Distress Inks - Vintage Photo, Rusty Hinge, Shabby Shutters, a hint of Walnut Stain plus a light spray of gold Perfect Pearls. 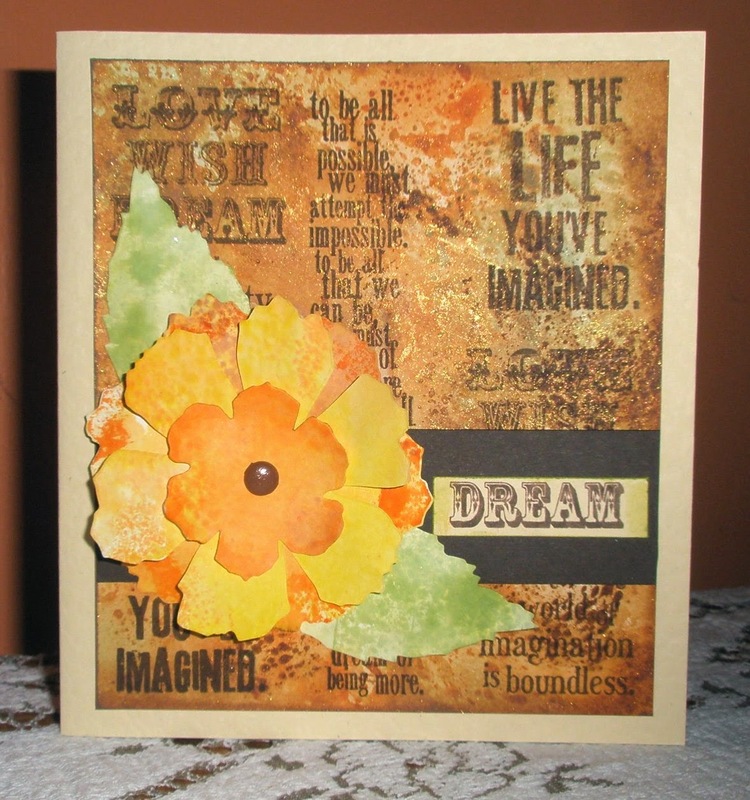 It's overstamped in Potting Soil Archival with 4 different word stamps from Tim Holtz all including dream or imagine. The flower (Rusty Hinge, Spiced Marmalade and Mustard Seed) is cut using the Tattered Florals die and the Shabby Shutter leaves are cut using the Tattered Leaves die. The daylight this morning is awful again - damp and dreary - so not good for taking photos but I hope this card brightens your day a little. Thanks for coming to visit!! What lovely layers of inspirational words - this is great! There's a gorgeous golden glow about it too... Thanks for joining us on A Vintage Journey.